progressing largely in concert with human settlements. to twelve million km2 during the same time span . P. P. N. RAJ ET AL. city and natural water flow regimes. cess of bringing all possible types of lands under plough. cultural setup of the country. ent characterized by high level of socio-economic growth. economic changes and building construction in the state. process of land conversion becoming more precipitous. and the total utilizable yield is 4,146 million m3 . whole basin from Global Land Cover Facility (www.glcf. Figure 1. Geographic location and general flow pattern of BRB. Figure 2. 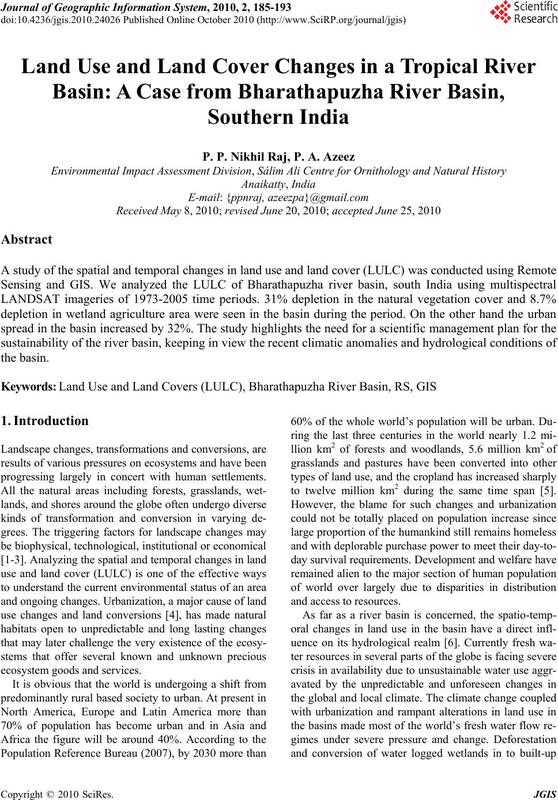 Temporal variation in LULC in Bharathapuzha River basin (generated from LANDSAT TM 1973, 1990, and 2005). during the later stage of the study (Figure 8). Table 1. Total land cover (in %) as a proportion to the total area, and the net change during the study period. Figure 3. 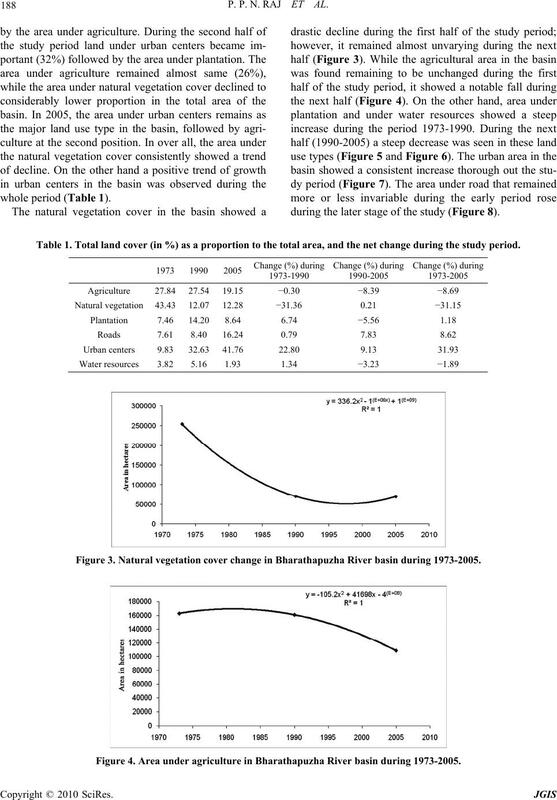 Natural vegetation cover change in Bharathapuzha River basin during 1973-2005. Figure 4. Area under agriculture in Bharathapuzha River basin during 1973-2005. Figure 5. 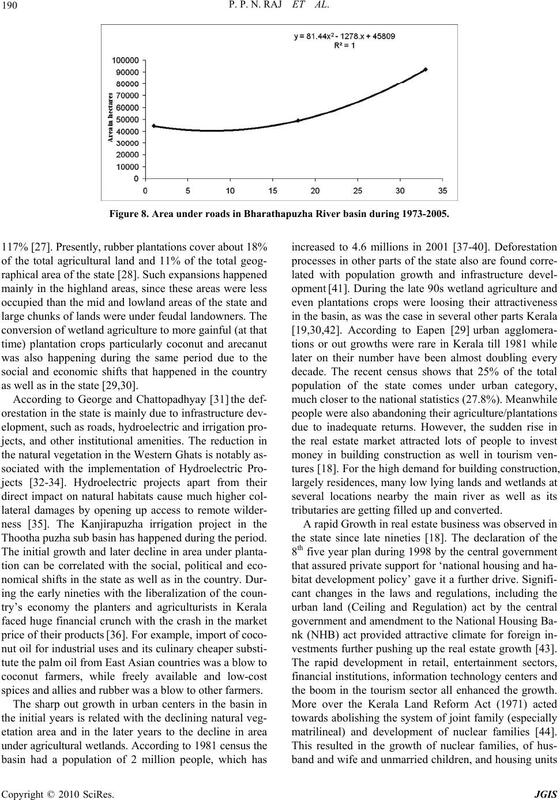 Change in the area under plantation in Bharathapuzha River basin during 1973-2005. Figure 6. 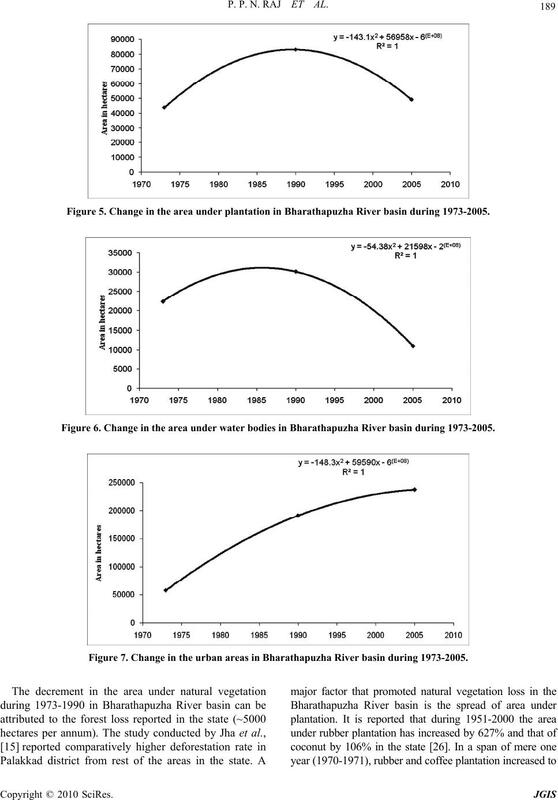 Change in the area under water bodies in Bharathapuzha River basin during 1973-2005. Figure 7. 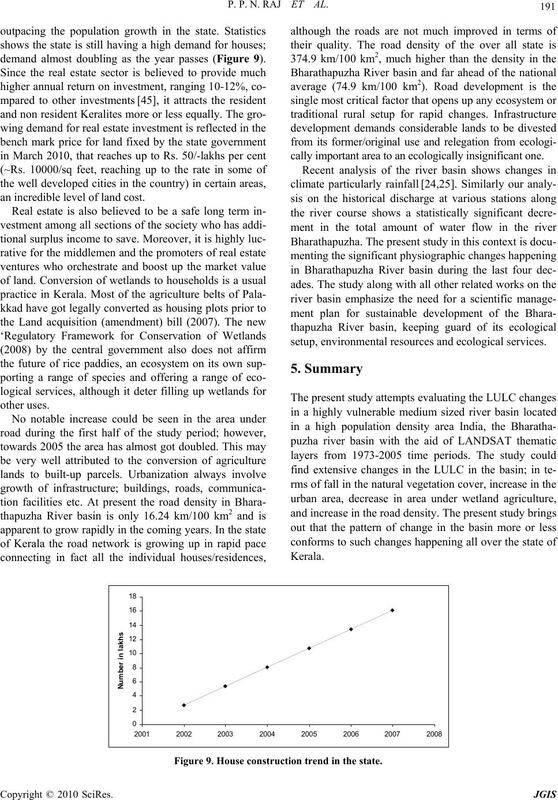 Change in the urban areas in Bharathapuzha River basin during 1973-2005. Figure 8. Area under roads in Bharathapuzha River basin during 1973-2005.
as well as in the state [29,30]. Thootha puzha sub basin has happened during the period. spices and allies and rubber was a blow to other farmers. tributaries are getting filled up and converted. vestments further pushing up the real estate growth . the boom in the tourism sector all enhanced the growth. matrilineal) and development of nuclear families . demand almost doubling as the year passes (Figure 9). an incredible level of land cost. cally important area to an ecologically insignificant one. setup, environmental resources and ecological services. Figure 9. House construction trend in the state. ous help during the analysis. Vol. 32, No. 2, 2004, pp. 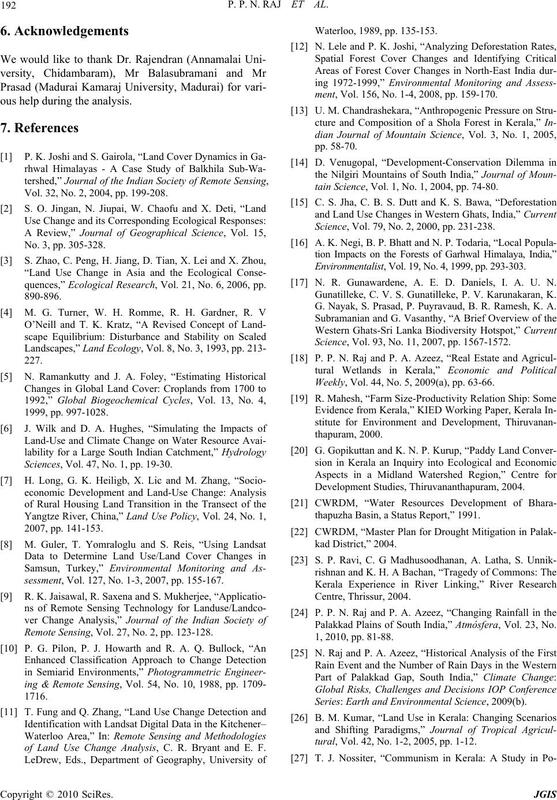 199-208.
quences,” Ecological Research, Vol. 21, No. 6, 2006, pp. Sciences, Vol. 47, No. 1, pp. 19-30.
sessment, Vol. 127, No. 1-3, 2007, pp. 155-167. 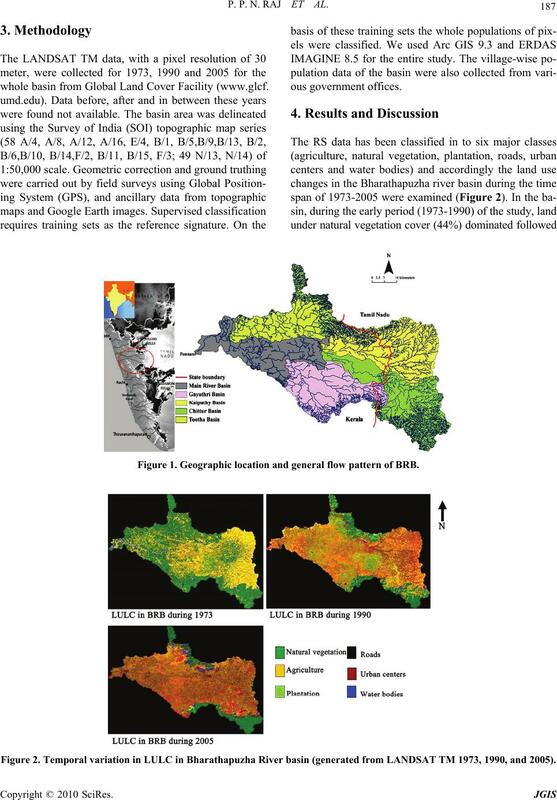 Remote Sensing, Vol. 27, No. 2, pp. 123-128.
of Land Use Change Analysis, C. R. Bryant and E. F.
ment, Vol. 156, No. 1-4, 2008, pp. 159-170.
tain Science, Vol. 1, No. 1, 2004, pp. 74-80. Science, Vol. 79, No. 2, 2000, pp. 231-238. Environmentalist, Vol. 19, No. 4, 1999, pp. 293-303. N. R. Gunawardene, A. E. D. Daniels, I. A. U. N.
Gunatilleke, C. V. S. Gunatilleke, P. V. Karunakaran, K.
G. Nayak, S. Prasad, P. Puyravaud, B. R. Ramesh, K. A. Science, Vol. 93, No. 11, 2007, pp. 1567-1572. Weekly, Vol. 44, No. 5, 2009(a), pp. 63-66.
thapuzha Basin, a Status Report,” 1991. Palakkad Plains of South India,” Atmósfera, Vol. 23, No. Series: Earth and Environmental Science, 2009(b). tural, Vol. 42, No. 1-2, 2005, pp. 1-12.
fairs, Hurst & Co. Publishers, New York, 1982. 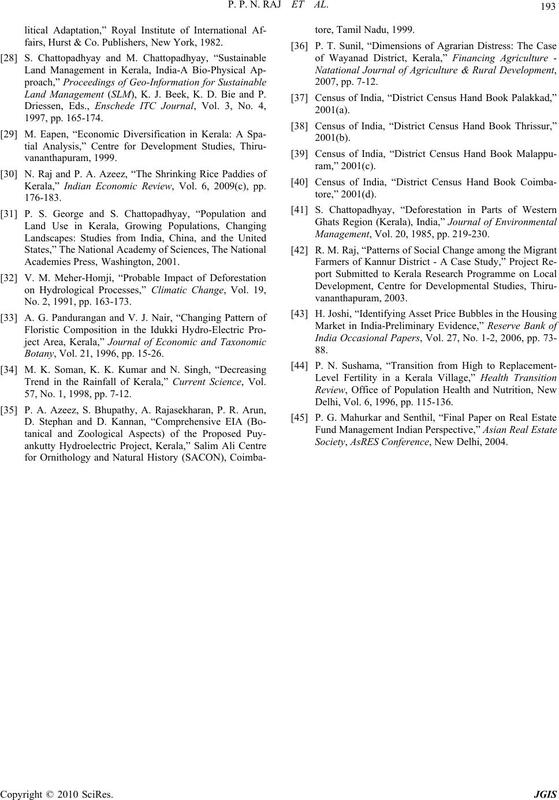 Land Management (SLM), K. J. Beek, K. D. Bie and P.
Kerala,” Indian Economic Review, Vol. 6, 2009(c), pp. No. 2, 1991, pp. 163-173. Botany, Vol. 21, 1996, pp. 15-26. 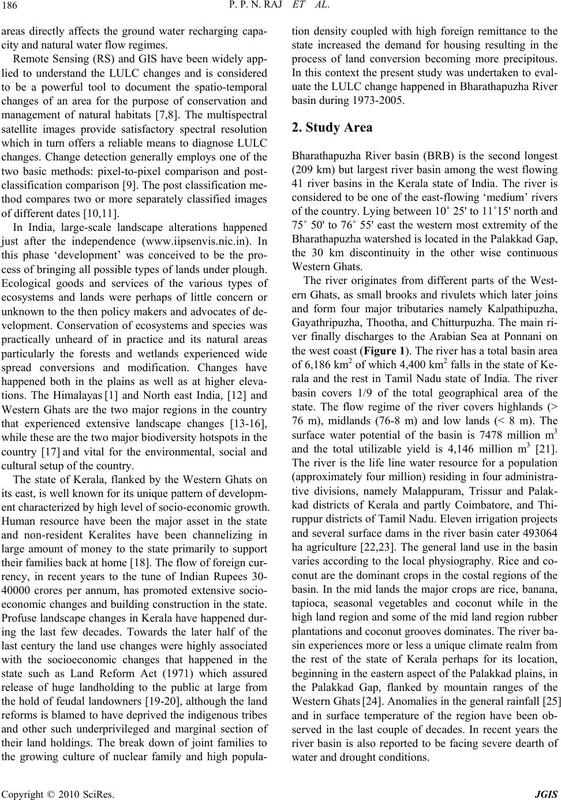 Trend in the Rainfall of Kerala,” Current Science, Vol. 57, No. 1, 1998, pp. 7-12. Management, Vol. 20, 1985, pp. 219-230. Delhi, Vol. 6, 1996, pp. 115-136. Society, AsRES Conference, New Delhi, 2004.